What: The Empire look to keep its playoff hopes alive on the road against the red-hot Barnstormers. Note: Empire WR Bryan Pray recorded 769 yards and 12 touchdowns with the Barnstormers in 2016. The Empire are 8-6 overall, 3-3 on the road and 1-2 in conference play. Spokane is coming off a 16-33 home loss to the Arizona Rattlers on June 3. They are averaging 41.7 points per game (7th in IFL) and are allowing 41.0 points per game (4th). The Empire are third in the Intense Conference. The Barnstormers are 12-2 overall, 6-0 at home and 4-0 in inter-conference play. Iowa is coming off a 58-36 road win against the Salt Lake Screaming Eagles on June 2. They are averaging 44.3 points per game (4th) and are allowing 36.2 points per game (2nd). The Barnstormers are first in the United Conference. Note: Roster information is subject to change and is presented here as a basic guide for following the game. Roster information is gathered from the IFL and the team's official websites. After a 7-2 start to the regular season, the Spokane Empire entered last Saturday’s game having lost 3 of its last 4 games, and still had the opportunity to pull into first place in the Intense Conference. Unfortunately, whatever chance the Empire had to take control of their playoff destiny, and the Intense Conference, vanished Saturday night at the Spokane Arena. In spite of spectacular play from the Empire’s defense, the offense never was able to get on track and scored only 16 points in the 33-16 defeat. The 16 points are the lowest offensive scoring output in Empire (and Shock) franchise history. It was a disappointing home season finale for Spokane’s 9th Man, in which many fans left the Arena with disappointment and frustration. Now with 4 losses in their last five games, the Empire have fallen to third place in the Intense Conference and currently sit on the outside looking in on a playoff spot. The Nebraska Danger own the tiebreaker over Spokane, having won their only meeting of the season on April 1st. Spokane either has to win out its next two games and Nebraska loses one of their games, or Spokane has to win one game and Nebraska loses both of its final two games. Spokane's task is easier said than done; the Empire have to travel to Des Moines to take on the red-hot Iowa Barnstormers. Facing an uphill task, and with a question mark at quarterback, will be a lot to overcome. The Empire’s offense took a big blow last week when QB Aaron Wilmer, who looked impressive in his first start against the Colorado Crush, struggled against the Rattlers. He got off to a good start on the first drive of the game by completing 1 of 2 passes, with the one pass going 27 yards for a touchdown to WR Orlandus Harris Sr. Unfortunately, Wilmer was inconsistent throughout the rest of the game, completing 11 of 21 passes for 88 yards and an interception. He was pulled near the end of the game and replaced by newly signed backup Marcus McDade, who completed 2 of 4 passes for 17 yards and an interception in his IFL debut. Head Coach Adam Shackleford was unhappy with Wilmer’s performance, stating that it would be a competition in practice this week for whom gets to the start on Friday night. Regardless if Wilmer or McDade starts, it’ll be a tough challenge for Spokane against a Barnstormers’ defense that has given up the second fewest points in the IFL. OS Trevor Kennedy was one of the few bright spots in last week’s game against the Rattlers. Although he only rushed for 4 total yards, he had a rushing touchdown and was the team’s leading receiver with 7 receptions for 86 yards. With the uncertainty at quarterback, look for Kennedy to have an increased role to help produce for the Empire, both in the passing game and in the ground game. RB Andrew Pierce will likely get more looks running the football; after rushing for only 12 yards last week, look for Pierce to be used to chip away away at the Barnstormers’ 2nd ranked rushing defense. If the Empire can find success in establishing the run, and utilize the versatile presence of Kennedy, it can benefit Wilmer or McDade and assist the passing offense. As improved as the Barnstormers’ defense is this year compared to last year, the Barnstormers have given up an average of 160.1 passing yards per game, the second highest amount of passing yards per game in the IFL. What’s helped contribute to their 12-2 record? The play of the Barnstormers’ defensive backs, which have the second highest interceptions in the IFL (21). The Empire’s wide receivers are going to have to step up against the Barnstormers’ secondary, and it begins with getting veteran Bryan Pray involved. Pray, who played for the Barnstormers last season, is the Empire’s leading receiver in receptions (54), yards (594), and touchdowns (15) but didn’t see much involvement in last week’s loss, catching one lone pass for 4 yards. Devonn Brown (37 receptions, 398 yards, 9 TDs) has been shut out his last two games, and Samuel Charles (30 receptions, 407 yards, 10 TDs) was held out of last week’s game for a potential concussion. Brown and Charles could help bolster Spokane’s passing attack, but look for Orlandus Harris Sr. to get some looks as well. Harris Sr. received a lot of attention last week, registering 4 catches for 38 yards and a TD. Defensively, Spokane’s unit has kept the Empire in games by playing at a championship level. They held their own last week against the Rattlers, allowing only 33 points in the game. Now they’re tasked with attempting to shut down a red-hot Barnstormers offense led by QB Travis Partridge. In addition to his 40 touchdown passes, Partridge leads the Barnstormers in rushing yards (565) and rushing touchdowns (22). They also possess a talented running back in Keshaudas Spence, who has rushed for 298 yards and 9 touchdowns this season. Getting pressure on Partridge, and shutting down Spence, is going to be huge for an Empire team in need of a win. DLs John Griggs 939 total tackles, 10.5 sacks, 16.5 tackles for loss), Harold Love (32 total tackles, 1.0 sacks, 5.5 tackles for loss), and Kaelin Burnett (14 total tackles) will have to get physical at the line of scrimmage and disrupt Partridge, while LB Nick Haag (65 total tackles, 5 sacks, 7.5 tackles for loss) will try and stuff Partridge and Spence to a minimal gain. The Empire’s defense took a big blow last week when LB Pasquale Vacchio went down with an apparent knee injury. LB/DL Andrew Jackson (89 total tackles, 4.0 sacks, 10.5 tackles for loss, INT, 5 pass breakups) will likely take over for Vacchio’s absence. DBs Tyree Robinson (75 total tackles, 2 INTs, 12 pass breakups), John Hardy-Tuliau (74 total tackles, 4 INTs, 7 pass breakups), Antoine Tharpe (20 total tackles, 4 pass breakups) and Que Cox (9 total tackles) will have their hands full going up against Iowa’s wide receiving corps, especially the dynamic duo of Brady Roland and Ryan Balentine. Both have over 600 receiving yards and double digit touchdowns this season. Containing Roland and Balentine will be a monumental task, which is why defensive line pressure will be essential. The Empire face a uphill battle of taking down the Barnstormers, but this is why they play the game. If the Empire can somehow pull off the upset, the playoffs will be within their grasp. 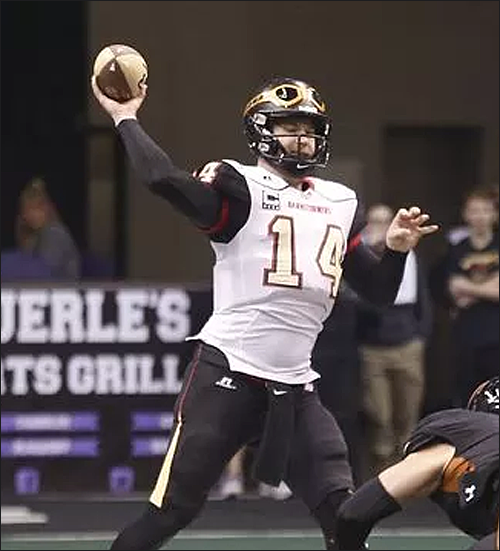 For the first time since the 2009 af2 Season, the Iowa Barnstormers have a winning record and are on the verge of their first playoff appearance in eight years, and their first since joining the IFL two seasons ago. They’ve been the hottest team in the IFL this season; after starting the year with a 2-2 record, the Barnstormers have won ten consecutive games and sit atop the United Conference. With a titanic game next week against the Sioux Falls Storm, which hasn’t finished outside of first place since 2009, the Barnstormers won’t take the Empire lightly as they try to win their eleventh straight game. With a win, the Barnstormers can a foothold on the United Conference regular season crown, which, with Sioux Falls coming to visit, could come down to the season finale to determine who hosts the United Conference Championship. QB Travis Partridge has thrived since earning the starting job late in the 2016 season. Last season, he started the final 5 games of the season. Despite losing in all 5 games, he completed 99 of 166 passes for 1,134 yards, 17 TDs and 4 INTs. He was also effective in the redzone, rushing for 7 TDs. This season, Partridge has played like a potential MVP candidate, completing 188 of 318 passes for 2,081 yards, 40 TDs and 11 INTs. His passing touchdowns and yards both rank 4th in the IFL, as does his average passing yards per game (148.6). He’s also the Barnstormers’ leading rusher, with 565 yards on the ground and a league leading 22 rushing touchdowns. Partridge is the ideal mobile QB, who can not only run in the open field, but has the size for goal line situations. That doesn’t mean he’s the Barnstormers’ only source of rushing offense. Iowa also boasts RB Keshaudas Spence, who ranks second on the team with 298 rushing yards and 9 TDs. He’s been finding more success in recent weeks; in his past two games, he’s rushed for over 55 yards (61 and 57 yards, respectively) and two TDs in each game. They’ll be facing a third ranked Empire rushing defense that was recently gashed for 101 yards last week against Arizona. Should the Barnstormers find success early in the running game, it could spell a long night for the Empire’s defensive players. The success of the Barnstormers’ offense has been the high levels of production from WRs Brady Roland, Ryan Balentine, and Lucas Hefty. Roland leads all Barnstormer receivers with 61 receptions for 750 yards and 18 TDs. 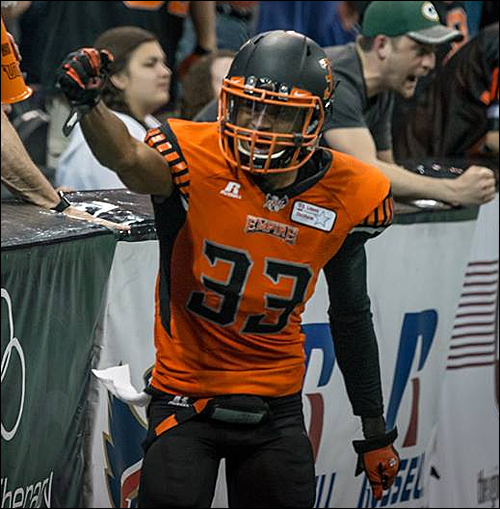 Roland’s had a First Team All-IFL caliber year, as he ranks third in the IFL in all three major receiving categories. Lined up the opposite side is Balentine, whose stats aren’t that far off from Roland’s, entering Friday’s game with 54 receptions for 668 yards and 12 touchdowns. Hefty, the third receiver, comes across as the forgotten man of sorts, but has put together a nice year with 45 receptions for 412 yards and 7 touchdowns. All three will look to take advantage of an Empire defense that’s missing LB Pasquale Vacchio and a youthful secondary. Defensively, Iowa ranks in the middle of the pack in total yards per game (216.7), second to last against the pass (160.1) but second in rushing defense (55.5). What’s contributed to the Barnstormers’ success has been the play of the defense; while it may give up a lot of yardage, the Barnstormers are tied for fourth in the league with 22 team sacks and second in the IFL with 21 interceptions. Facing an Empire team that doesn’t know who its starter is puts the advantage in Iowa’s favor. Putting pressure on either QB Aaron Wilmer or QB Marcus McDade will be the priority for the Barnstormer’s DL, led by IFL sack leader Ra’Shawde Myers. With 11 sacks on the season, as well as 39 total tackles and 14.5 tackles for loss, Myers has been difficult to stop this season and could make things difficult for an Empire offensive line that’s been inconsistent this season. LB Javicz Jones, the team’s leading total tackler with 138, has been all over the field with 2 sacks, 9 tackles for loss, 3 interceptions and 4 pass breakups. Putting the pressure on Spokane’s QBs will be important, as will shutting down Spokane’s running game duo of Trevor Kennedy and Andrew Pierce. Should the Barnstormers shut the Empire’s running game down, it’ll put the pressure on Spokane’s rookie QBs into forcing throws. Iowa possesses a talented array of defensive backs, including Jamie Bender (72 total tackles, 4 INTs, 11 pass breakups), Bryce Enyard (64 total tackles, 2 INTs, 5 pass breakups), Daejohn Love (56 total tackles, 5 INTs, 3 pass breakups), Matt Goldsmith (32 total tackles, 3 INTs, 5 pass breakups) and Dee Maggitt Jr. (24 total tackles, 4 INTs, 3 pass breakups). Spokane possesses talent at receiver, but with uncertainty at QB and as to if Samuel Charles is healthy, it could be a big day for the Barnstormers. On paper, this looks to be favorable odds to the Barnstormers, so don’t be surprised if the Barnstormers end up with a wide margin of victory. However, Spokane has been known to explode for points, which could be tricky. Empire HC Adam Shackleford on the Empire's 33-16 loss to Arizona. "We sucked on offense. We were prepared, he [Aaron Wilmer] just didn't play well. They didn't do anything we hadn't seen. They were just the better team. We were way off." Empire RB Trevor Kennedy's assessment of the Offense and the Defense. "We have a championship defense and the offense has to do better. I have to to do beter." Empire DB John Hardy-Tuliau on the team's playoff chances. "We have some work to do. All we can do is win the next two games." The race for the top two spots in the United Conference will come down to the final two weeks for the Iowa Barnstormers, Sioux Falls Storm, and the Wichita Falls Nighthawks. Once of these teams will finish with at least 12 wins and not earn a berth in the playoffs. Regardless of how the season ends up for the Iowa Barnstormers, this season has been highly successful. 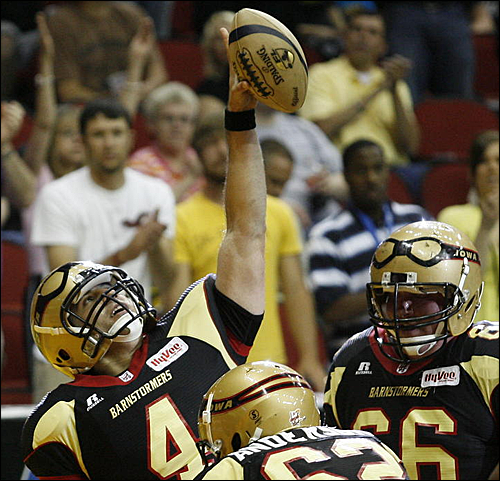 The Barnstormers will finish above .500 for the first time since 2009, when they were members of arenafootball2. Their 12 wins also matches their win total from 2009. Should the Barnstormers win one of their final two games, it'll set a franchise record for most wins in a regular season. The Barnstormers' best regular season records were both at 12 wins (12-2 in 1996, 12-4 in 1999). Should the Barnstormers clinch a playoff berth over the next two weeks, it'll be significant as the team has not made the post-season since the 2009 Season. In that season, the Barnstormers would defeat the Manchester Wolves 70-53 in the American Conference Quarterfinals before falling to the Green Bay Blizzard 51-46 in the American Conference Semifinals. I will be watching tonight. 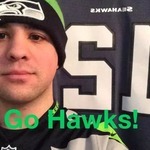 I might get home right around game time, but I will be there! I'm curious to see how this game ends up affecting the playoff picture, with both teams being both close to being in and out of the playoffs. I think the Barnstormers will run rough shot over the Empire and have even more momentum going into the Storm game, but I could very well be wrong about that. As far as the QB competition in Spokane goes, I would start Wilmer though I would have him on a short leash. Spokane still hasn't named who their starter is quite yet. We'll find out at kickoff. I'll run the scoring updates, but someone might have to take over for part of the 3rd Quarter when I'm getting food at Halftime (and is likely to run into the 3rd). I'm here. Let me tweet out the link. I can do what I can. I'll start with the quarter summaries. Everyone is getting off work shortly and should be coming home soon after. Aaron Wilmer will get the start at QB. Marcus McDade is on standby if Wilmer struggles. LB Pasquale Vacchio is out for the rest of the season with a broken leg. We're going to have color on color tonight. Empire going with Orange Jerseys, Iowa going with Black Jerseys. That has to hurt about Vacchio. Literally. David, how similar is that an impact to the defense as Trevor Kennedy's broken leg was to last year's offense? This looked closer to Vacchio's knee. Trevor's was more near the ankle. Spokane wins the toss. Iowa will get the ball to begin the 1st half. Anyone else having loading issues with youtube's stream? Stream is going for me. Unfortunately, Iowa's feed has "choppy" video so this is the best we're going to get. Early penalty on Spokane for Illegal Defense. Wipes out Nick Haag's sack. Tyree Robinson getting checked around his calf.